Do you know the first names of the children in this photograph? A black and white negative of two young girls and a baby. In this view a young girl is sitting in a chair with her arm around a baby. Another young girl is standing beside the chair. All three children are facing the photographer. 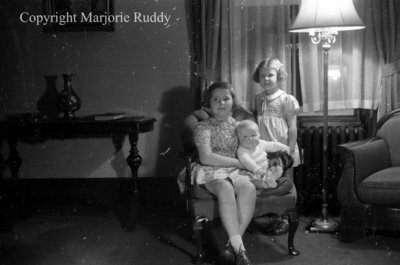 Thompson Children, November 21, 1939, Marjorie Ruddy. Whitby Archives A2013_040_825B.